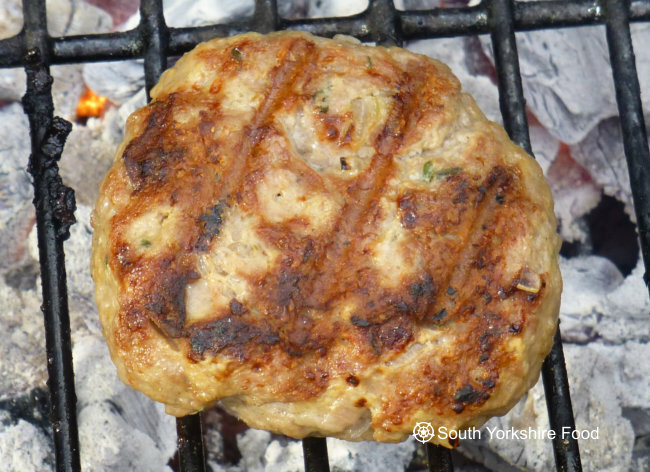 South Yorkshire Food - The Best Burger Recipe - Ever! - The Best Burger Recipe - Ever! The Best Burger Recipe – Ever! This is my favourite burger recipe, that works equally well, with either beef or lamb. I personally think that lamb burgers are much tastier that beef burgers, but I have tried both and they are both delicious. Add a little oil to a non stick sauté pan and gently cook the shallot until it is soft, but not browned, and put aside to cool for five minutes. Add the cooked shallot, the other ingredients, (not the oil) and the salt and pepper, to a mixing bowl, and mix them well using clean hands. Tip: To check the seasoning is OK, fry a teaspoon full of the mixture in the non stick sauté pan in which you cooked the shallots. Adjust seasoning if necessary. Wet your hands and shape the mixture into four patties. Put them in the fridge for a couple of hours to let the flavours develop. Brush them with olive oil before cooking them on a hot barbecue or grill pan for five minutes each side. Turn them only once. Rest on a warm plate before serving with your favourite accompaniments.